The 1st of April 2018 sees new energy regulations come into force. 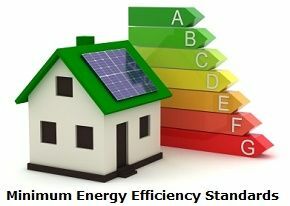 Minimum Energy Efficiency Standards (MEES) apply to the properties of buy to let landlords. MEES ENERGY: New plans introduced by the UK Government will affect landlords in England and Wales. The regulation change in energy efficiency means they must comply from April 2018. Landlords should prepare spending up to £5,000 upgrading rental properties to meet energy regulations. The change in Energy Efficiency Regulations became law in March 2015. What will happen when the Minimum Energy Efficiency Standards begin? It will be unlawful for landlords to grant a new property lease with an Energy Performance Certificate rating below Band E.
New legislation is likely to mean raising the energy efficiency of their rental homes. Typical improvements could include fitting new boilers and installing cavity wall filling and insulation. The Residential Landlord's Association believes MEES affects more than 300,000 buy to let homes. It means that Victorian and Edwardian properties could be most affected. They warn that the new 'green tax' could also increase rental charges. The UK Government proposes a cap of £5,000. They claim that most landlords are unlikely to pay more than £1,800 to upgrade. But, there are calls for the government to provide alternative support for landlords. This renewed call comes following the end of the Green Deal. The Green Deal provided loans to improve energy efficiency. These loans were repaid by tenants resulting in lower utility bills. It looks likely that tenants bear the brunt of these extra energy costs through higher rents. It's viewed as a positive move to improve rented accommodation quality. But they want another scheme to help cover the costs of the improvements. The early announcement of the energy regulation changes should help UK landlords. They can spread the cost of improvements over several years before the implementation. Minimum Energy Efficiency Standards become mandatory for new tenants in 2018 and for all existing tenancies in 2020. Borrowing from buy to let mortgage providers will mean full compliance with the regulations. Mortgage applications may become more difficult to get as property valuers amend their criteria. As a rule, landlords must follow relevant statutory requirements for insurance purposes. Non-compliance with forthcoming energy efficiency regulations could lead to difficulties getting property insurance. In fact, there are fines set in motion for rogue landlords with energy Band F and G rated properties. They need to upgrade and improve their homes to avoid potential prosecution. Breaching the new regulations could impose a civil penalty up to £4,000. Articles on Workplace and Benefits: Hot off the press workplace news articles from A to Z. Assured Shorthold Tenancy Notice: Check out the new AST rules for landlords and tenants. Gas Safety at Work: British Gas Business says safety failings could put workers at risk. Immigration and Visa Laws: A guide with current information on visa and immigration rules. Landlord and Tenant Rules: How to follow the strict rules of conduct on tenancy agreements. Landlord Right to Rent Checks: The new rules for anyone renting out a room to tenants in England. Workplace Safety Records: UK claims one of the best workforce safety records across EU.